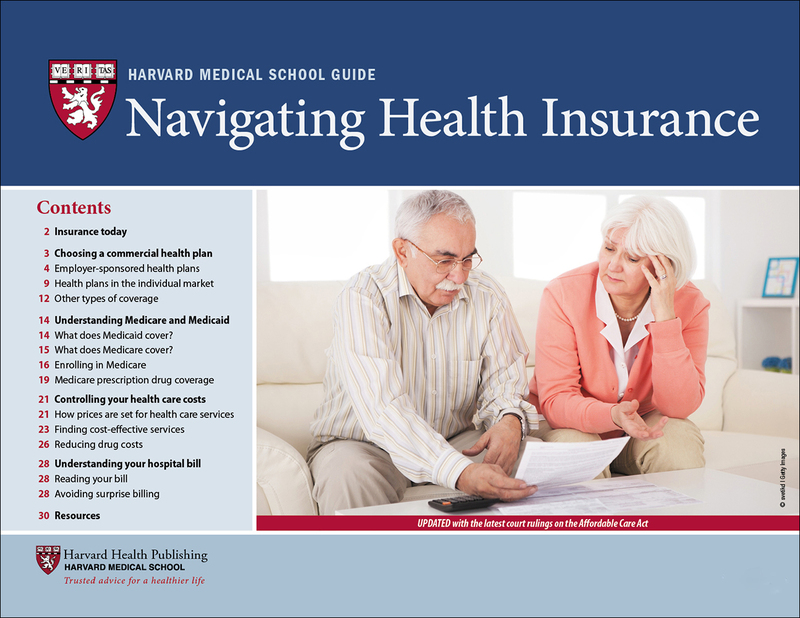 This Harvard Medical School Guide will help you compare health plans, estimate your costs, understand Medicare and Medicaid benefits, decipher your hospital bill, take steps to avoid unexpected charges, and reduce prescription drug costs. Understanding some basic concepts about health insurance will help you better navigate the health care system no matter what changes unfold in the coming years. UPDATED: To include latest changes for 2018–2019 enrollment period. Recent changes in the U.S. health care system have made decisions about health insurance more complicated and difficult, and potentially more risky—not only for your pocketbook, but also for your health, if you are unable to afford the care you and your family need. Health care is now more expensive than ever for consumers and their families. In 2016, an American family of four spent, on average, more than $25,000 on health care. With all the changes—and the increasing expense—it is more important than ever to make good decisions about your health care. For example, imagine that your elderly mother is having knee pain and the orthopedic surgeon has ordered a CT scan. How can you make sure you’re not being overcharged for the scan? If she needs knee replacement surgery, how can you estimate, before the surgery, how much your mother will need to pay? Or, imagine that your employer has added a high-deductible health plan as one of the options in your benefits package. How do you decide if it is a good option for you and your family? How will selecting a high-deductible plan affect your costs? Finally, imagine that you will soon turn 65 years old. You are thinking about switching from private insurance to Medicare. How will you make the transition? How will you decide which Medicare option is best for you? Health insurance has a language all its own. Familiarizing yourself with the key terms below will help you evaluate your options. Deductible: The amount that the insured person (or family) must pay for medical services before the insurance plan begins paying. Some family plans have a deductible for each person (for example, $1,000) and for the family as a whole (for example, $2,000). In-network, out-of-network: An arrangement in which certain health care providers (in-network) have an agreement with a specific health plan to accept a discounted rate for their services. Out-of-network providers do not have such an agreement with the health plan. Generally, in-network services are less expensive for the insured person than out-of-network services. In some plans, such as exclusive provider organizations (EPOs), out-of-network services are not covered at all, except for emergency care. Lifetime limit: The maximum amount of coverage a plan will provide while an insured person is on the plan. Prior to the passage of the ACA, many plans included a lifetime limit (for example, $1 million for each person in a family plan). Under current legislation, lifetime limits on most benefits are prohibited. Managed care plan: A health plan that provides comprehensive health services and offers financial incentives to use care providers affiliated with the plan. Examples of managed care plans include EPO, HMO, PPO, and POS plans. Narrow network: A method used by some health plans to control costs. A plan with a narrow network covers services from a smaller number of care providers. Contracting with fewer providers gives the health plan more bargaining power, allowing the plan to negotiate lower costs for services. In some, but not all, cases, these savings are passed on to insured people in the form of lower premiums. If you choose a plan with a narrow network, you may have a lower premium than you would for a plan with a larger network, but you will have less choice in care providers. If you obtain health care services outside the network, it will generally cost you more than for in-network services, or it may not be covered at all. In that case, you will be responsible for paying for these services.